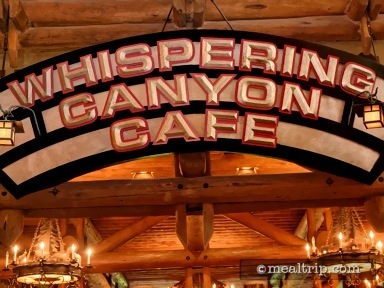 The red top tables and wooden chairs (complete with painted cartoon-like Cowboy and Indian backs) set the stage for the Whispering Canyon Cafe's whimsical, kitschy take on wild west dining. There's a whole shtick that goes on here with wise-cracking wait staff "sassing customers" and whatnot. It's not exactly at "dinner show" levels, but this should probably not be thought of as a romantic quiet place to have dinner. While many guests partake in the All You Care To Eat (BBQ-ish) Skillet, there are in fact, quite a few a la carte options available for dinner. All of the cuisine falls into an "American West Frontier Fare" category, offering specialties such as "slow smoked pork ribs and roasted chicken", being very careful not to call itself "BBQ" per say. The location is accessible from the interior first floor of the main Wilderness Lodge building and is very, very close to the front entrance of the lobby.